My father has been on oral diabetic treatment for many years and it has adversely affected his kidney function. He is now on insulin treatment. I suffered from gestational diabetes and since I have a family history of diabetes, I am afraid that I am a likely candidate for diabetes. I am interested in natural solutions for diabetes. I have known for quite some time now about the benefits of Gymnema Sylvestre in lowering blood sugar levels. I have a bottle of it which I got from my online food supplement store. But the thing with this tablet is that I am supposed to take it about half an hour before a meal. And I keep forgetting to do it! 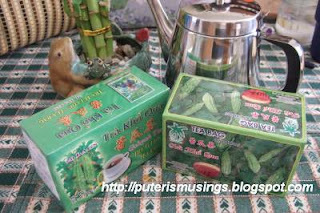 I have recently discovered that bitter melon (peria, in Malay) also have some benefit in lowering blood sugar levels. There has been in fact a study on the effects of bitter melon (Momordica charantia) on serum and liver triglyceride levels in rats.